Dubai Gulf News reported today that in a shocking case of property fraud, an Indian resident in Dubai has been locked out of his own apartment that was sold to someone else while he was travelling. On January 8, Memon, who bought the 914 square foot apartment for a little over Dh250,000 got its title deed transferred to his name. The same day Sameer lodged a complaint with the public prosecution seeking criminal action against Port Real Estate, Memon and Dinara for cheating and fraud. “It looks like they used a forged power of attorney. Never in my wildest dreams had I thought that I would be fighting a case of house grabbing in Dubai. I bought this apartment with my hard-earned money. My wife and I spent days furnishing it. Now everything is gone — not just the house but its entire belongings worth several thousand dirhams. I want justice,” he said. This entry was posted on January 12, 2012 at 01:14	and is filed under Criminal Complaint, Dubai, Dubai Property Fraud, Dubai Real Estate, Fraud. 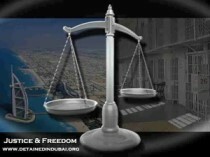 Tagged: Dubai criminal, Dubai fraud, International City Dubai, Real Estate legal. You can follow any responses to this entry through the RSS 2.0 feed. Both comments and pings are currently closed.